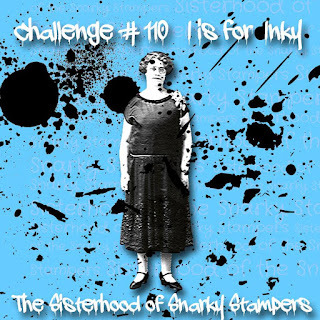 Today's new challenge at the Sisterhood of Snarky Stampers is I is for Inky. I decided to try for inky AND pretty, so a long step out of my comfort zone! For the background I smooshed distress inks in green, blue and pink, allowing each to dry before adding the next and then spraying the whole thing with water to allow the inks to blend. When it was all dry, I spritzed with some gold mica powder in a spray bottle of water. I die cut the stitched square and then ran a pen along the "stitching" lines to make it look like real sewing, then matted the square on black. Next I used some very old stamps - probably all around 20 years old and random unmounted ones of unknown origin - to stamp a selection of leaves and flowers onto watercolour paper and coloured them in using the same inks I had used for the background. To do this, I daubed each inkpad onto an acrylic block then picked up the colour with a water brush, diluting it as needed. I finished them off with touches of gold gel pen. Then I cut them out with a narrow white border and attached them with Pinflair glue to give lots of dimension. Finally I used my computer to generate the sentiment and added it, tucking it slightly under one of the leaves to link it to the floral corner. We'd love you to come along and get inky with us, and who knows, you may be crowned Queen or Princess of Snark. No need for snark on this beautiful card. Love it! Love the background and the gorgeous flowers and that stitching!!!! Gorgeous card, beautiful background and those flowers are fabulous love, love, love it. So my understanding is, you were being snarky by making your inky card pretty? I would have felt snarky after fussy cutting all those elements. ;) It really is a beautiful card! What a great background and the die cut stitches are awesome! Fab card! 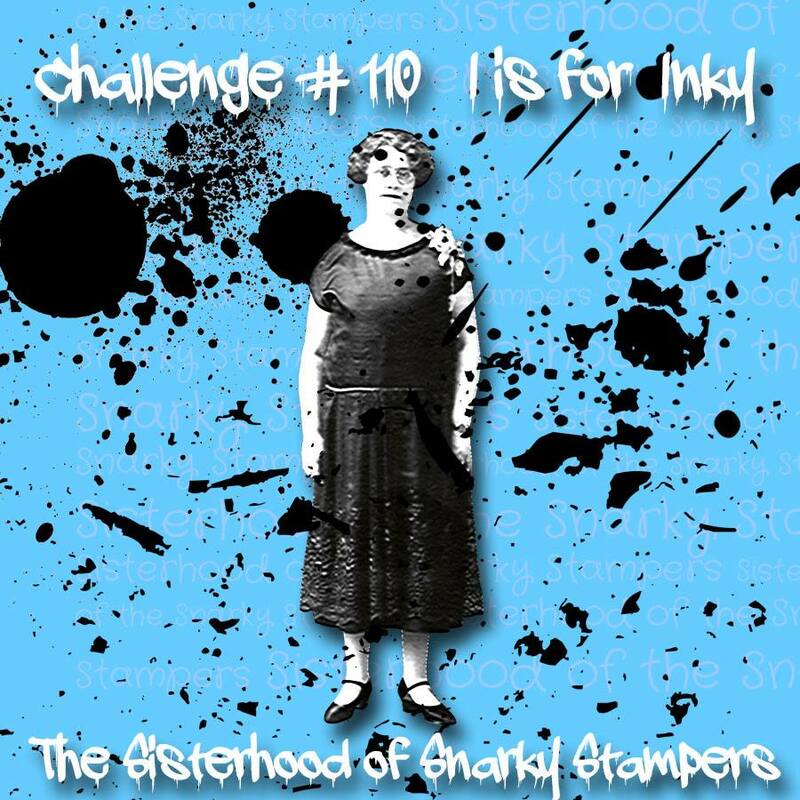 You made simple stamps stand out! The dimension is rad (I heart paper!!!) achieved with just simply fussy cutting! Your inky colors are gorgeous. Hey- smart thinking to use an acrylic block as a palette! Did I understand that correctly?-- 'cuz it's ingenious. I like it. Lovely inkiness and super display of blooms Jane, many thanks for joining us in with our May challenge at Stamping Sensations. Wow! A fabulous self created background for your wonderful flowers. Getting messy is out of your comfort box but it is worth it. So pleased you played along with us at MMM. Caz DT. Is it vintage or shabby chic?